Cap: 10-50+ mm in diameter, hemispheric to campulate expanding to broadly convex to nearly plane with age. Pins brownish olive maturing to grayish white. Flesh readily bruising bluish. Stem: 80-115+ mm in length. Typically equal, sometimes slightly enlarged at base. Yellowish to gray bruising bluish. Gills: Attachment adnexed. Mottled grayish coloration in young fruit bodies becoming black in maturity. Spores: 10-13 microns, black in deposit, somewhat transparent under magnification. This strain is exceptionally large for the species. Under ideal conditions this strain results in mushrooms with caps a full centimeter larger than published maxima. 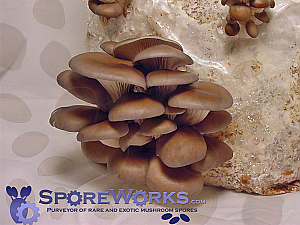 See also Panaeolus cambodginiensis, Sandose Domesticate and the Sporeworks Subgenus Copelandia Gallery. Gerhardt E., 1996. Taxonomische Revision der Gattungen Panaeolus und Panaeolina. Bibl. Bot. 47, Schweizerbart?sche Verlagsbuchhandlung, Stuttgart. Ola?h, G.M., 1969. Le genre Panaeolus: essai taxonomique et physiologique. Revue de Mycologie, Memoire Hors-Serie 10. Stamets, P., 1996. 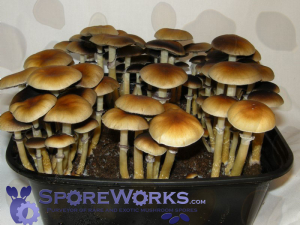 Psilocybin Mushrooms of the World. Berkeley, Calif.: Ten Speed Press. Combo Savings! 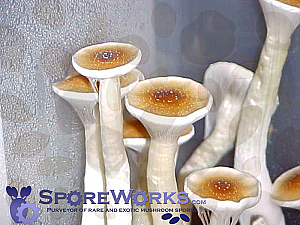 This sample is also available in a combo pack of four unique strains of Panaeolus cyanescens. 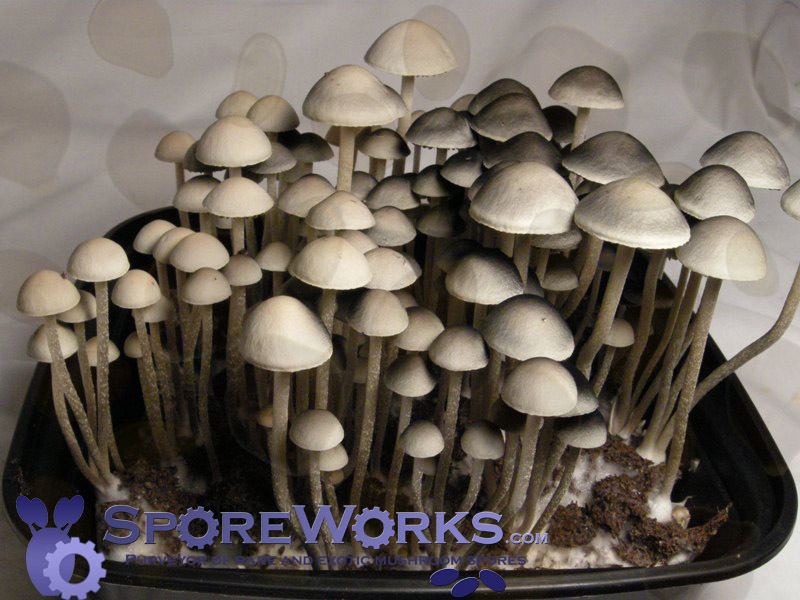 Purchase the Panaeolus (Copelandia) cyanescens : Four Strain Combo Pack and save over 25%!